From M25 – J. 13 – there is a roundabout under the M25 as you come off, from either direction. 1Take the A30, heading south. The road runs parallel with the M25 briefly, and sweeps round a sharp left hand bend (called The Glanty), under the M25. Stay right, down to the roundabout in front of you just the other side of the M25, which is now above you. Go round the roundabout and back under the M25. This road is called The Causeway. Carry on down this road, over the small roundabout at Sainsbury’s and at the bigger roundabout turn right (signposted B3376 – Thorpe, Chertsey, Woking), with Sainsbury’s on your right. 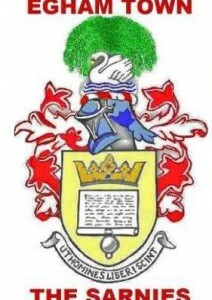 Proceed down Thorpe Road, over a level crossing, to a mini roundabout, (from which, if you look over the right, you can see the floodlights) which you go over, and on the left, after the green turn into Pond Road. Left into Wards Place (young children playing! – please drive very slowly and carefully) then first right and you will see the entrance to the football ground and showroom. From A30 – If you are coming from the London direction, when you reach Staines take the Staines bypass rather than go through the town which gets very congested due to traffic light changes. At the end of the bypass you come to the M25 J13, so please follow the M25 J13 direction above. From A30 – From the south. 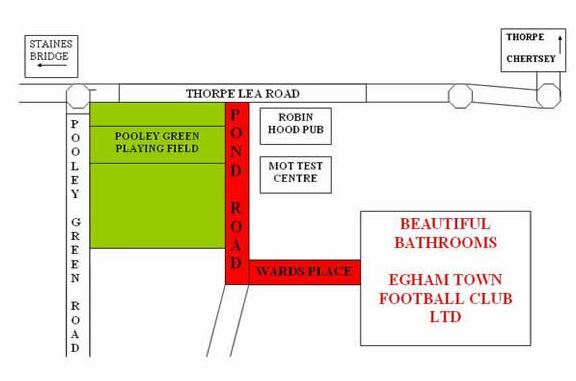 Please don’t get fooled into thinking that the foorball ground and showrooms are in Egham! Go down Egham Hill, over the roundabout, down the Egham bypass, with Runnymede (large green open space) to the left, and at the roundabout aim straight across and under the M25, heading towards Staines. This road is called The Causeway. Carry on down this road, over the small roundabout at Sainsbury’s and at the bigger roundabout turn right, with Sainsbury’s on your right. Turn left down Thorpe Road (B3376 -signposted Thorpe, Chertsey, Woking), over a level crossing, to a mini roundabout, (from which, if you look over the right, you can see the floodlights) which you go over, and on the left, after the green turn right into Pond Road. Left into Wards Place (young children playing! – please drive very slowly and carefully) then first right and you will see the entrance to the ground and showroom. From, or via, Chertsey – First landmark is Thorpe Park, which you drive past with the entrance on the left. Carry on down that road to the very end, where you will need to be in the left hand lane. (To the right is a large roundabout and straight ahead is the back of Sainsbury’s and to the right is Staines Bridge.). Turn left down Thorpe Road signposted B3376 -signposted Thorpe, Chertsey, Woking), over a level crossing, to a mini roundabout, (from which, if you look over the right, you can see the floodlights) which you go over, and on the left, after the green turn right into Pond Road. Left into Wards Place (young children playing! – please drive very slowly and carefully) then first right and you will see the entrance to the ground and showroom.